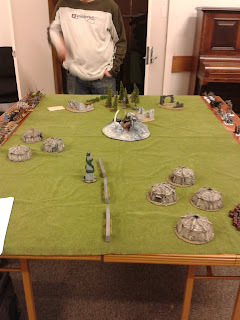 The Battle Field looked like this. 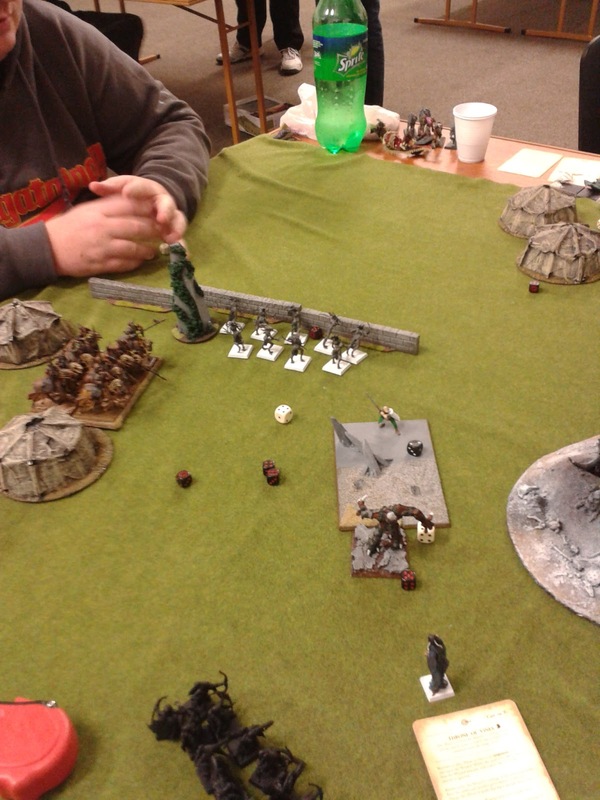 Deployment for me was a case of trying to counter my opponents, which I didn’t do a very good job of. At one point in the game I commented that I have tactics for every phase but the deployment phase. Nick deployed his 3 big blocks in the center, with fell bat swarm 1 and the black coach on the right flank, and the vampire lord, both units of dire wolves and hex wraiths and the last fell bat swarm on the left flank. The photo above also shows Nick’s vanguard moves on the left flank. The Treemen preformed wonderfully. 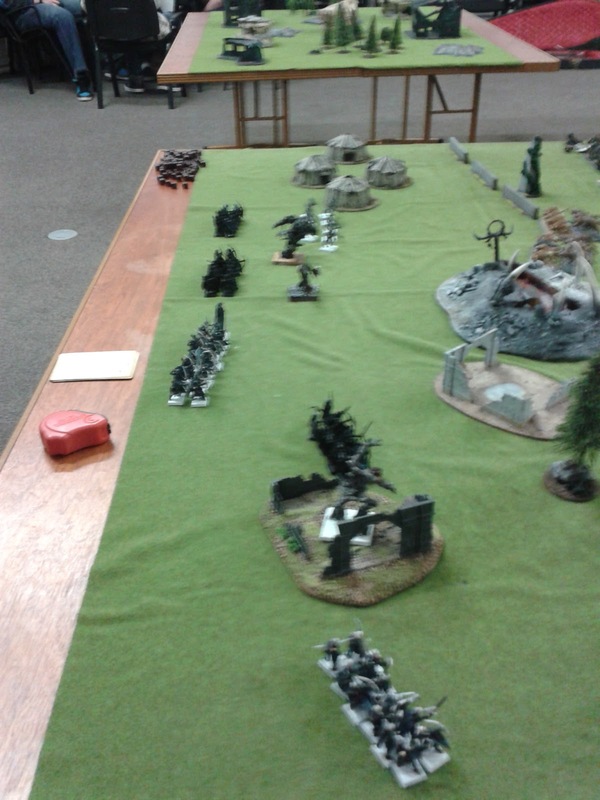 My deployment split them up and the lone Treeman on the right flank held up 50 skeletons and a increasingly powerful black coach for two turns. 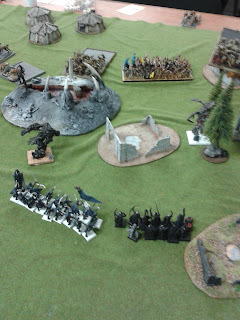 This meant that the usually lethal black coach only fought one of the toughest units in my army. The archers did what was required of them and shot things. Together all of them accounted for shooting off all Nick’s chaff (dire wolves and bats), and killing about 15 zombies. The terrain made shooting an issue as it blocked clear LOS meaning that on top of long range modifiers the archers had to contend with soft and hard cover for most of the game. The Magic part of the army won me this game, hands down. Lore of life should be the only lore a Wood elf level 3 or 4 takes. 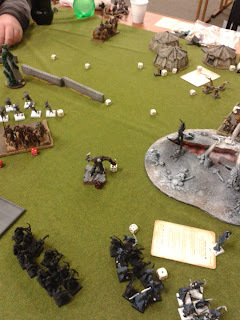 In this game it boosted unit toughness to make them able to take being run over by Hexwraiths. It Dwellered off a far chunk of the skeleton block. But most of all it kept the Treeman Ancient alive due to the lore attribute. 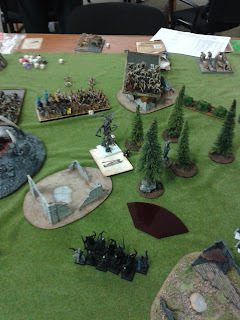 In Nicks turn 2 he charged his Vampire Lord on zombie dragon into the Treeman Ancient, who I had positioned facing the Vampire. This was the combat that I had wanted from the deployment phase. Treeman are tough and with the Annoyance of Nettlings causing opponents to hit only on 6’s in challenges the Ancient was ready for a fight. This combat went on for 2 turns, and I would have lost it if my life mage hadn't hung around and restored the Treeman's wounds with the lore attribute. The combat took a routine feeling, Nick went first and, thanks to the Annoyance of nettling's, hit about once or twice and wounded about that much due to the treemans high toughness, armour save and 5 up ward save. The Treeman would then have a similar performance and get one wound though the vamp’s defenses. If it wasn’t for the life mage I would have lost, a Treeman may be tough but it can only do so much against a vamp lord and zombie dragon. 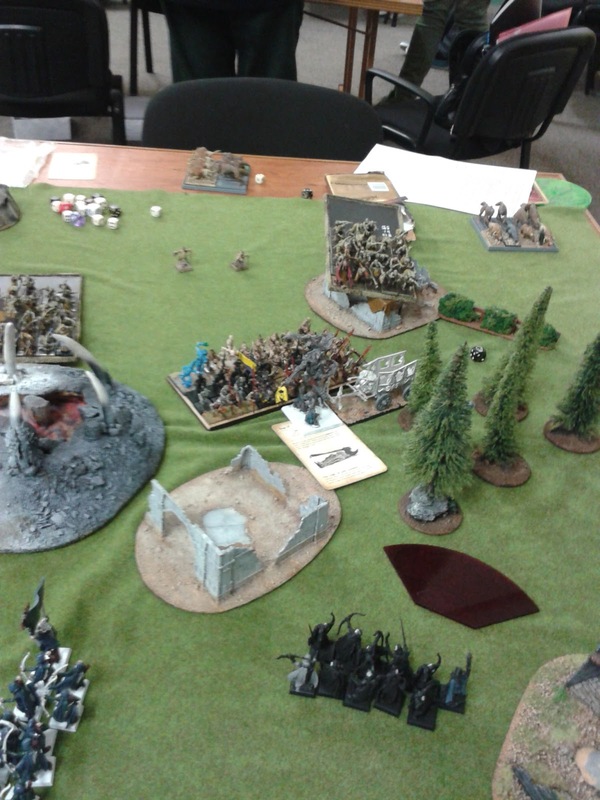 On top of that while the generals fought my line was crumbling, having no way to deal with the Hexwraiths (who were causing the left flank to collapse) or the 3 big blocks on the right flank my army was slowing walking backwards to the edge of the board. 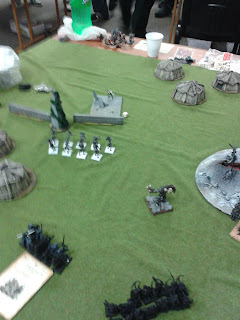 And then the Treeman struck the killing blow against the vampire lord, which caused the 4 Hexwraiths in one of my units flanks to pop, along with: 5 Hexwraiths from the other unit, the zombie dragon, all but 10 of the skeletons, about 15 zombies and 2 wounds from the black coach. 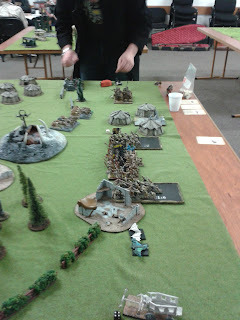 On top of that one of my other Treemen had killed one of Nicks level 2 Necromancers meaning his army general was waaay out on the right flank after his zombie unit ate 12 glade guard. 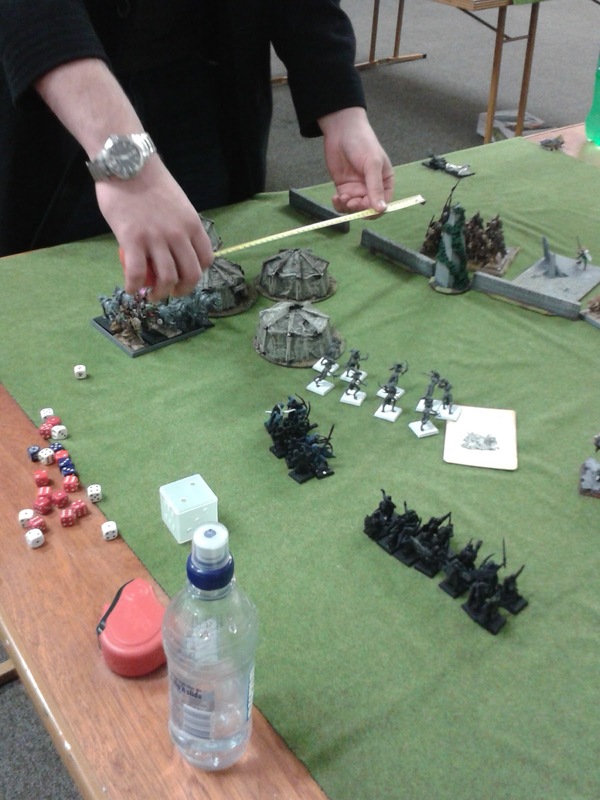 With his army out of position and severally damaged Nick graciously conceded the game to me. It was a very hard fought game where victory really did seem a long way off. But I won it. 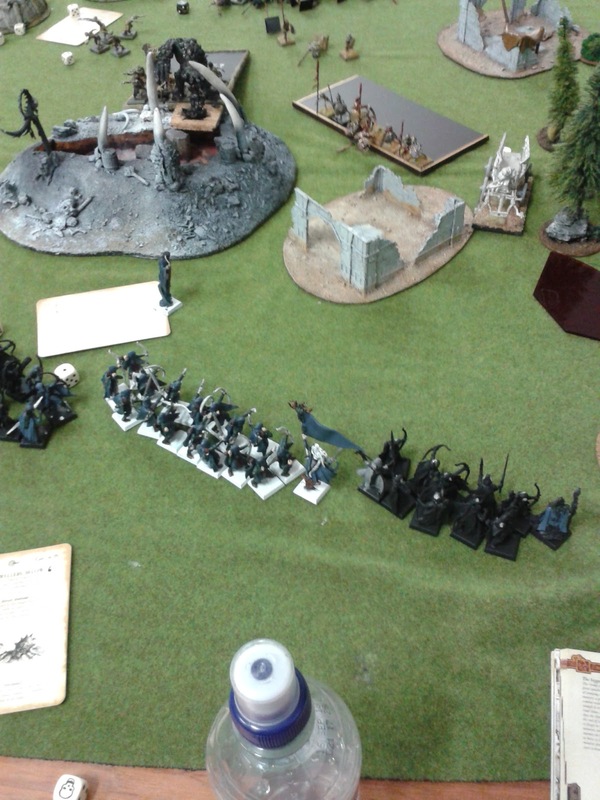 Victory number one for the Wood Elves.